Here is the third of the posts talking about some of the issues that I am currently dealing with. Please remember these are simply my writings about my personal experience from my journals if anything in this raises concerns for you please see your dr or a medical professional for help. The first two I dealt with the easier of the four major issues I am living with (though they might be easier to describe they are not necessarily easier to live with.) This post will deal with Functional Neurological Symptom Disorder how that is affecting me and then I will deal with the memory and cognitive issues in another post. Functional Neurological Symptom Disorder is a big long name that describes a big long list of symptoms that occur due to a problem with the function of the nervous system and how the brain is sending or receiving messages. It has also been referred to in the past as Conversion Disorder (the brain is converting the message into something that the body isn’t receiving correctly) or Somatoform disorder (we have all heard the term psychosomatic before – meaning it is a disorder relating to the interaction of the brain and body.) What we know is that with Functional Neurological Symptom Disorder there is no physical damage to the brain such as tumour, MS, stroke etc. If we think of the brain as a computer then the brain itself is the hardware and the nervous system is the software then Functional Neurological Symptom Disorder is a problem with the software and not the hardware. The good news with this is that for the most part symptoms of Functional Neurological Symptom Disorder are not permanent and in time with the right targeted therapy or even just time alone you will get better or back to normal (better and normal might be different to what they were in the before FNSD world though). What are the symptoms of Functional Neurological Symptom Disorder? There is a huge long list of different symptoms such as hemiparesis, limb weakness, headaches, etc and if you are interested I will include a website that has a lot more information that you can read. My particular symptoms are that I have functional left side weakness (or hemiparesis), my arm and leg are affected, they feel different in fact if I had to describe it I can actually feel them and I am extremely aware of every single movement my arm and leg make. If you think about your limbs I know for me I am not conscious of how my right arm or leg work/move I just use them to do what I want and they do it. But my left arm feels like it has a heavy, heavy weight sitting on it and to get it to move I have to think really hard sometimes it works and sometimes it doesn’t. I was told by my physio today that my leg movement is improving out of sight and that I am no longer dragging it as I walk, which is all good news. As you can imagine this is all incredibly frustrating for me and the family. I hate relying on other people to do things for me and I am sure that there are times that they get annoyed having to do lots of things for me! Of course this loss of independence has a huge impact on my mental health and if I didn’t already have issues there I am sure I would now coping with this! I am lucky I had a good dr who recognised what this was very early and was able to ensure I got the right approach to treatment. For me that is a multi-disciplinary approach, OT, phsyio, psych, neurology, neuropsychiatrist. I am only seeing OT, physio and psych on a weekly basis and the others as needed. The challenge with rehab is to ensure that I have the right balance between doing enough to ensure that there is improvement and not too much that I go backwards. Functional Neurological Symptom Disorder is for the most part cause unknown. The researchers think that for some people stress and past trauma can have an impact however, this is not the case for all people so why some people will get this and some people won’t is really unknown. Though for me from reading my journals I would think that stress and past trauma have played a huge part for me. Most definitely if there was no psychological issues that were part of the cause they would certainly become part of the problem with the time it takes for diagnosis for many people. My psychologist thinks that I have been in one way or another manifesting symptoms of FNSD for years I had a period of hysterical blindness where my eyesight couldn’t be corrected with glasses to be legal to drive but it corrected itself this was after a particularly awful trauma, I had about 12mths with no voice after an incredibly stressful period in my life, I have always been a migraine/headachey person. In all of these other instances the symptoms eventually self resolved when either my brain had processed the trauma enough to be able to cope or let go of the stress enough to move forward. This is typically not how it works. There is no causal link between x and y causing z. There are often lots of contributing factors and even the immediate pressing trauma, grief, incident, stress etc could actually be another symptom of FNSD and it is in fact accepting that there is a neurological condition and treating that will aid recovery most. Obviously if there are other issues that are pressing and need to be dealt with it is important to work on those as well but generally working on the psychological issues alone will not resolve FNSD. In my case it is thought that something came to a head this in turn reacted with all the other past trauma including some of my closest relationships, muddled everything up in my head and started sending out muddled signals to my arm and leg, so it was almost as though my brain was in one big constant panic attack and didn’t know how to stop the cycle. I understand that I spent significant time in hospital addressing the physical symptoms, and I was discussing with my psych today that I get this sense that there was this feeling or expectation that if I just accepted and faced up to my issues then I would be back to normal and better. I can’t be certain I really have nothing at all to base this on and I don’t even know what hospital I was in or who was treating me. So it is a strange thought to have. She actually affirmed what I was saying and that is most definitely a common misconception about FNSD, people and often these are our treating physicians or those closest to us just want us back to “normal” or “better”. What is normal and what is better in the after of a FNSD diagnosis can be very, very different to what would have been “normal” or “better” in the before. 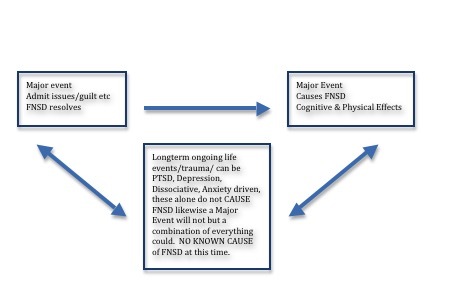 The reality is for me and many like me the “event” that was the end result that appeared to be the “cause” of the FNSD but is thought to be really another symptom that also needs to be worked through. So in my case facing up to my demons helped more with my psychological recovery (which still has a long, long way to go and is ongoing) than my physical or cognitive symptom recovery from FNSD. Either way it was and is an important thing to do and whilst it might read like I am writing in code the truth is I do not know or understand or remember, the how, what, why of the event. I know (through my journals and sessions) that this has been resolved and everyone has moved forward. I may never get access to that part of my brain to give me that information. My psych tells me that all I really need to know is that it has happened and dealt with and it is time to move forward. 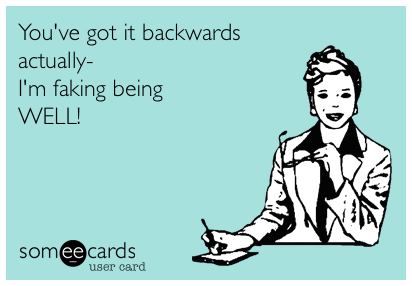 Time to start finding the “better” and “new normal” for me. These could be very different from the before me and could be difficult for people around me to get used to as regardless of what the cause was I am different and I am changed as I process the things in my head. Most importantly, I am improving as hard as that is and as slow as the recovery may feel (though too be entirely honest I don’t remember yesterday so maybe it isn’t that slow at all!) I am improving. Of course as with any recovery I have good and bad days which is to be totally expected, but hopefully there are more good days and less bad days. Typically people tell me I look really good better than they have seen me looking in a long time so I MUST be doing better. 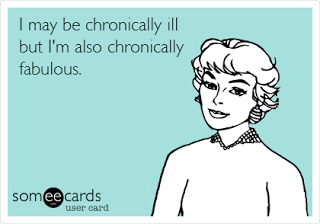 The truth is I know that my illness is invisible and that because it is invisible it is hard to understand. There are no physical outward signs (except my stick for balance/dizziness) and I probably do look better because I am finally getting help for my misfiring brain. 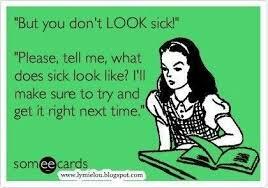 Sometimes people can think that an invisible illness is a “fake” illness but the truth is that for most people with any type of invisible illness (could be neurological like Parkinson’s or MS, Dementia, FNSD, or psychological like depression, anxiety, bipolar or something else like Crohns, Chronic Fatigue, Epilepsy, Seizures, Endometriosis or more) they are actually faking being WELL, because they are over their illness just as much as you are. Here is a video put together by an organisation in the US FND Hope that also explains it a little bit. * Edited 29/1/16 to add all the new information that has been part of my psychological recovery and more information I have learnt about FND.